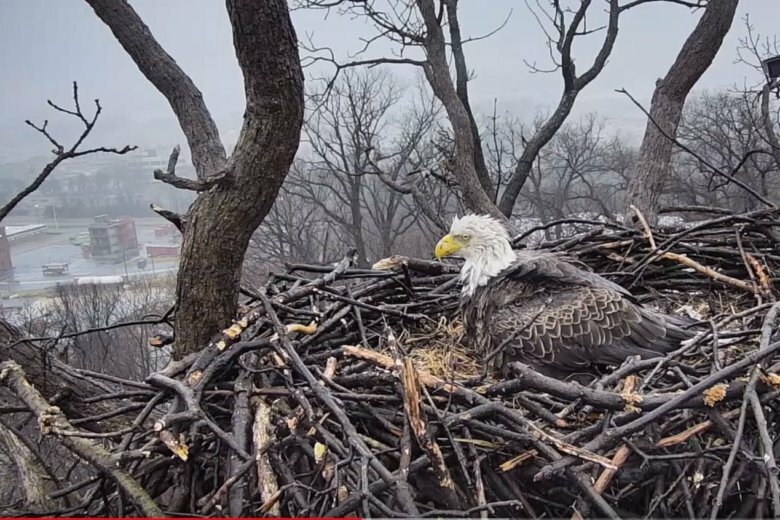 A pair of D.C. bald eagles — Liberty and Justice — laid their first egg of the year on Tuesday, but the male eagle hasn't been seen in days. WASHINGTON — A pair of D.C. bald eagles — Liberty and Justice — laid their first egg of the year on Tuesday, but the celebration is accompanied by a delightful bit of drama. Supporters of the longtime pair are no doubt scandalized. Liberty and Justice have been together 14 years, raising their young in a nest over 100 feet off the ground in an oak tree at the D.C. police Academy in Southwest, D.C. As Liberty stands in the home she and Justice have shared for over a decade, it must be challenging to keep the memories at bay. Liberty — who’s primary duty as a mother is to incubate her egg — will vigilantly stand guard over her egg from now until it hatches in approximately 35-40 days (March 18-25). Justice is supposed to aid her in this painstaking task — but where is he? Justice is also tasked with the crucial job of catching fish and bringing them for his mate and chicks once the egg hatches. No indication yet if this mysterious Aaron Burrd is up to the task. The drama doesn’t end there. Liberty usually lays her eggs — and dates her men, it appears — in twos. Since the Earth Conservation Corps began monitoring their nest in 2005, Liberty has typically laid two eggs. The Corps remains on #EggWatch2019 as they await a potential second egg in the coming days. Bald eagles returned to the D.C. area in 1999, more than half a century after pollution forced them out in 1946. Volunteers from the Earth Conservation Corps attempted a bold experiment translocating 16 eaglets from nests in Wisconsin to an artificial “hack box” at the U.S. National Arboretum, where they were raised for six weeks before released into the Washington skies. In the spring of 1999, five years after the first juveniles were released, bald eagles Monique and Tink took up residence in the area and built the first bald eagle nest D.C. had seen in over 50 years. Liberty and Justice built their nest in 2005, and a third pair of eagles built their nest in 2015 at the site where it all began — the National Arboretum.